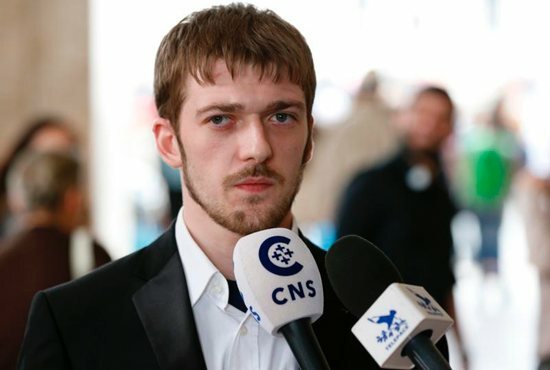 Begging Pope Francis to help his son, Alfie, Tom Evans met with the pontiff, pleading for “asylum” in Italy so his seriously ill son may receive care and not be euthanized in England. “If Your Holiness helps our child, Your Holiness will be potentially saving the future for our children in the U.K., especially the disabled. We pray the problem we are facing is solved peacefully and respectfully as no child deserves this,” Evans said in a statement he personally delivered to the pope April 18. The private meeting came before the pope appealed publicly yet again for appropriate care and respect for 23-month-old Alfie Evans. “I would like to affirm and vigorously uphold that the only master of life — from its beginning to natural end — is God,” the pope said at the end of his weekly general audience April 18. “Our duty is to do everything to safeguard life,” he said before leading the thousands of people in the square in a moment of prayer and reflection. He asked those at the audience to pray that the lives of all people, especially Alfie, be respected. The pope’s appeal — the third he has made publicly — came after he met with Alfie’s father, who also attended the general audience with VIP seating in the square. The encounter lasted 20 minutes, according to the Italian Catholic news site, “La Nuova Bussola Quotidiana,” which had one of its reporters accompany Evans at the meeting. The news site said the last-minute meeting was made possible by Bishop Francesco Cavina of Carpi, whom the site said was designated by the pope to act as a conduit between the Evans family and the Vatican Secretariat of State. Gently rubbing a small green rosary between his fingers, Evans, who is Catholic, told reporters that his son is being “held hostage” at the hospital, and he and his wife are “being treated like criminals and prisoners.” The family has been fighting to remove Alfie from a Liverpool hospital to be transferred elsewhere. Evans said he thought the meeting with the pope went very well. “I’ve seen the love and the care and the emotion in his eyes. I’m so fortunate to have had that opportunity” to meet the pope and talk about saving his son, he told Catholic News Service. “I’ve prayed every day,” he said, and though “God hasn’t come through yet,” he thought the next step should be the pope, because he understands that no one has the right over Alfie’s life, but God. He also asked the pope to speak out publicly again during the general audience in support of Alfie, and the pope did. Evans asked the pope to help him bring the baby to Italy to the Vatican-run Bambino Gesu hospital, and the pope said, “Yes” and immediately turned and spoke to Bishop Cavina, according to Patricia Gooding-Williams, who was at the papal meeting acting as the translator. Bishop Cavina worked in the Vatican Secretariat of State for a number of years before being ordained a bishop in 2012. The pope blessed Evans and told him he really respected his courage, saying he had “the same courage as God has for his children,” Gooding-Williams told CNS. In a statement then posted on Facebook, Evans thanked the pope for meeting with him and begged him for his help. “I am now here in front of Your Holiness to plea for asylum. Our hospitals in the U.K. do not want to give disabled children the chance of life and instead the hospitals in the U.K. are now assisting death in children,” the statement read. “We have fought for Alfie for one and a half years and we now have realized our son’s life does not mean much to the NHS,” the National Health Service in the U.K., he wrote. Mariella Enoc, president of the Vatican-run hospital, said they are ready to welcome Alfie. “We certainly do not promise to cure him, but to take care of him, without aggressive treatment,” she said in a statement published by the Italian bishops’ newspaper, Avvenire, April 14. Three specialists from Bambino Gesu examined Alfie at the Liverpool hospital and determined “a positive outcome would be difficult, but the baby’s suffering can be alleviated,” she said. Doctors in the U.K. have not been able to make a definitive diagnosis of the 23-month-old child’s degenerative neurological condition. However, doctors at the hospital have said keeping the toddler on life-support would be “futile,” and he should begin receiving palliative care. A high court judge backed a lower court’s ruling, saying the hospital can go against the wishes of the family and withdraw life-support. In an effort to fight that decision, the parents, Tom Evans and Kate James, took their case to the European Court of Human Rights, which found no indication of any human rights violations and declared their application “inadmissible” March 28. The parents want to transfer their son to Bambino Gesu to see if it is possible to diagnose and treat his condition, but the high court ruling would prevent that from happening, according to the parents’ lawyer. “We affirm our conviction that all those who are and have been taking the agonizing decisions regarding the care of Alfie Evans act with integrity and for Alfie’s good as they see it,” the bishops said.